Coat slow-cooker with cooking spray. Cover and set on high to heat. 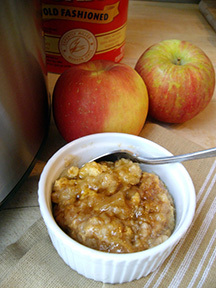 Pour hot apple juice into preheated slow cooker. Stir in oats, salt, apples, and cinnamon. Cover slow-cooker. Over stove, heat milk and vanilla on medium heat until mixture begins to simmer. Remove from heat. Combine eggs and granulated sugar in a bowl. Whisk ½ cup of the hot milk into egg mixture. Whisk warm egg mixture into the remaining milk. Pour mixture over the oatmeal and apples. Do not stir. Turn slow-cooker to low and line the lid with 2 paper towels. Cover and cook on low for 3 to 3 ½ hours. Uncover and sprinkle with brown sugar and serve.